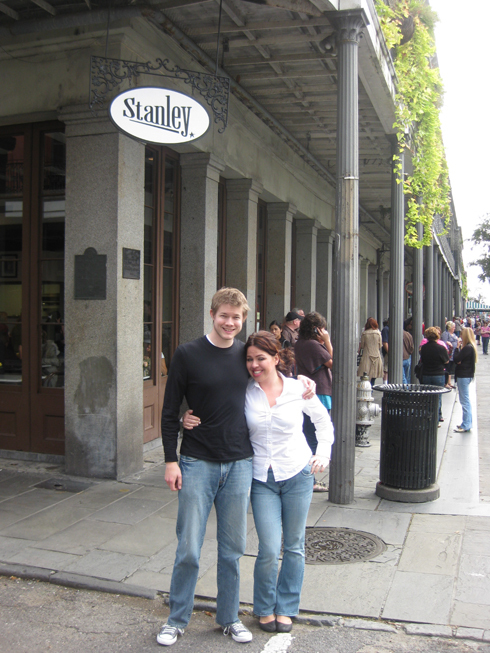 While we were in New Orleans, we stumbled across Stanley’s Restaurant quite by accident. For breakfast in the French Quarter Saturday morning we were headed to Cafe du Monde when we saw the enormous line and decided against it. Diana asked a local shopkeeper where we should eat and she recommended Stanley’s. We went to the north side of Jackson Square and saw that there was a significantly shorter wait. We put our names on the list and Diana and Camie went shopping for a minute while Mike and I waited patiently at first and then not so patiently. It took a while to get a table, but the host was very nice and explained exactly what was going on and when we could expect a table. After a while, our time to be seated finally came. We got a four top with a view of the street and the cooks. Diana and I were trying not to eat too much so we could eat lunch at Mr. B’s. 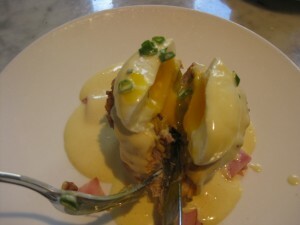 so we decided to split the Breaux Bridge Benedict, which happened to be really rich. I’m very glad we split it. I am not very keen on breakfast, but the Breaux Bridge Benedict is one hell of an exception. It was one of the best breakfasts I’ve ever had.